But. It doesn't have GPS. This makes it a dealbreaker for almost any serious athlete. Any athlete, that is, who is unwilling to stash their smartphone in their shorts like bouncing flubber. I truly don't understand the people who strap their half pound phones to their arm like a Shake Weight. Yes, it's cheaper than buying a dedicated training watch, and it plays music, but really? Instead, if you do a variety of athletic activities, especially of the triathlon persuasion, the Garmin Vivoactive is a great watch. Here's why: I don't have to take it off, ever, except to charge it once a week for 30 minutes. It tracks my steps, sleep, swims, biking and running -- even on a treadmill. It's just barely thin enough to fit under a shirt sleeve. It complains when I don't move enough at work. And it's always with me so I never forget it on hikes or other outdoor activities. It has an awesome silent alarm clock, so you can (a) put earplugs in to drown out your neighbor's death metal and (b) not wake your partner in the morning. When I first got the watch, I tried some of the smart features. Text notifications, emails, etc. It was occasionally more convenient than my phone, but it turns reading emails into a two step process of parsing the snippet on the watch, then turning to the phone to read the full message and respond. Ultimately I was just able to use my laptop, since I'm already looking at it all day. I didn't need yet another device buzzing at me, but you might find more use for the notifications. Unlike the Apple Watch you can't take phone calls, use Siri, or order dinner on your watch. Someday I might find more use for those added features, but I don't need them yet. This is the first swim-capable watch I've had and it works great in the pool. Having the watch track me is a great motivator when I don't have a coach telling me how long my sets should be. And I can look back later on Garmin Connect to see if my stroke count is improving. The app store that Garmin has put together is crappy but slowly improving. I wish it were better, but most of the apps aren't very useful. There are two non-native apps I use a lot: the Meditate countdown timer and the stopwatch. I initially tried using a watch face app, but I found that it drained the battery more quickly than the native watch face. That may have improved in recent updates of the software. 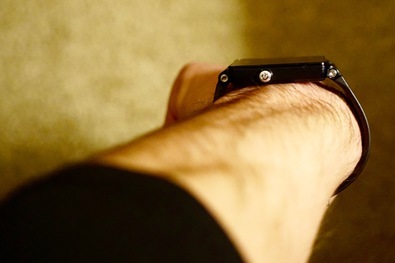 The watch is square, which means it can occasionally snag corners on clothing. And the screen is a transreflective display, meaning it isn't always backlit and can occasionally be hard to see without the backlight. It's still way better to have this display than give up multi-day battery life. The touchscreen works well enough; it's not as fluid as an Apple device but I suspect that's also part of saving battery life. The interface takes a lot of swipes to navigate to, say, the alarm clock which I change all the time. The settings screen has six different sub-menus, this might be quicker to navigate with a grid of icons. If you're an intense, data driven athlete, the Vivoactive doesn't currently support power meters on the bike, it doesn't have a barometric altimeter, it doesn't support custom workouts, and it doesn't have a built in heart rate monitor. 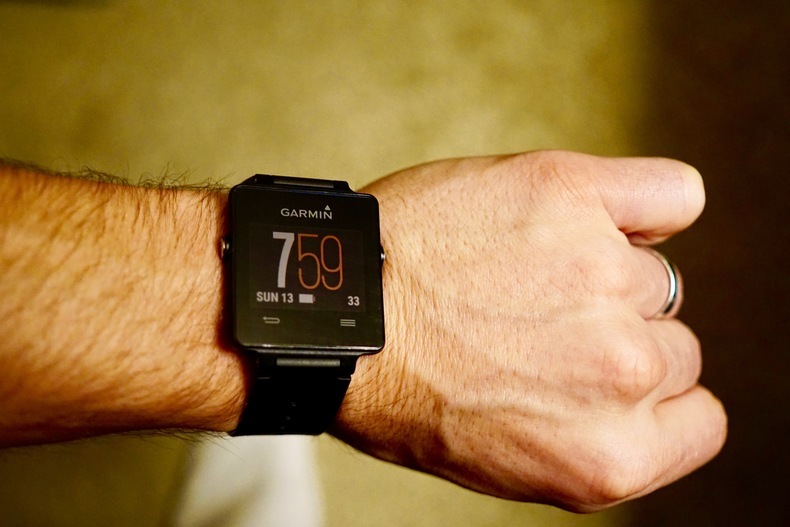 I expect the heart rate monitor to be added next year, but for the other things, Garmin made the Fenix watch. I tried the last revision of the Fenix and found that it's a great looking round watch, but it's just too big and I don't need half the features it has. What about triathlon? It doesn't have a tri mode, and the GPS only lasts for 8-10 hours.What kind of watch do pro triathletes use during a race? Most of them use a simple waterproof Timex, because all that matters is time. If you're trying to track an Ironman, an extra few seconds changing from Bike to Run mode won't ruin your transition time. Even so, I like to think the Vivoactive is a great all around training watch, because most workouts even leading up to Ironman distance won't be more than 10 hours. And if you do ultramarathons, you need a psychiatrist, not a smartwatch. Kidding. Sort of. Ray Maker has done a much more in depth review of the watch, but I just wanted to hit the highlights of using it as an everyday athlete. If you don't swim regularly, you might find a straight running watch or biking computer to be a better fit. But as a triathlete trying to stay more active during the day and be able to track hikes, the Vivoactive hits a sweet spot as a mostly complete training partner. The only real omission is built in heart rate monitoring, but since Garmin is already adding this to their other watches it's only a matter of time before it comes to the Vivoactive. If you want a watch that tracks swimming, or is simply waterproof for everyday wear, there aren't a whole lot of other options. Dedicated triathlon watches from Polar, Garmin and Suunto are generally thicker, larger watches that are harder to wear all day every day. The only other similar watch is the Withings Activite, which is a more stylish everyday watch but it doesn't have GPS or heart rate monitoring. Eventually, other smartwatches will have enough compelling features to use them instead of a training-oriented watch like the Vivoactive. But until then, I'll stick with the Vivoactive as my daily training companion.